E. Hotaru: Welcome to another exciting round of Mercury Vs. Today we have handsome Tuxedo Kamen, defender of Sailor Senshi Vs. The Unwinned Sailor Mercury. P. Tomoe: Silent Messiah, have you noticed that MTV now has something much like we have? Celebrity Death Match. I assure you viewers, we were around first! E. Hotaru: But Celebrity Death Match has so much more coverage. I wonder if Jackie and Janelle will shell out the money to have us all claymation. That'd be fun. E. Hotaru: Otou-san, please, this is family programning. Well, the fight has started. Tuxedo Kamen is staring directly into Mercury's eyes and he's saying stuff, can we have audio please? Tuxedo Kamen: "Sailor Mercury, be brave, the rabbit flies at Moonlight." P. Tomoe: What IS he talking about?! E. Hotaru: Shh, Otou-san, this is his patented "Stupid-Vague-Advice Technique." Tuxedo Kamen: "One of the principle functions of a friend is to suffer the punishments that we would like, but are unable to inflict on our enemies." P. Tomoe: OOH! That was dirty! He just wacked Mercury in the knee with his cane. E. Hotaru: That was an interesting quote he used, Aldous Huxley, I do believe. Mercury is retaliating by biting Tuxedo Kamen's hands. How savage. E. Hotaru: Oh my god! He's shoved the rose into Mercury's eye. Is there nothing sacred anymore?! 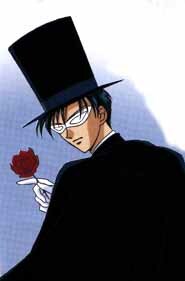 Tuxedo Kamen: "A Rose by any other name would smell as sweet. Isn't that right, Tsukikage no Knight?" P. Tomoe: What? Tsukikage no What? What's he talking about? Why is he talking to himself? Mercury looks pissed now...Look behind you Tux!! P. Tomoe: *wince* Ow, oh, Tux's grandkids are going to feel that one. There should be a law about directing attacks below the belt. E. Hotaru: And Tux is on the ground, this'll give Mercury some time to pull that rose out of her eye. P. Tomoe: Tuxedo's saying stuff! Turn the audio back on! Tuxedo Kamen: "He was a wise man who invented God, wasn't he? Aristotle said that. I bet you think you're so smart, well I went to Harvard for college!" Sailor Mercury: "It wasn't Aristotle who said that, you idiot, it was Socrates!" E. Hotaru: Actually, it was Plato. E. Hotaru: Oh goodness, they're fighting again, Mercury is doing a continuous stream of ice onto Tuxedo Kamen. He's getting really, really annoyed. P. Tomoe: It's about time he whipped out his La Smoking Bomber! E. Hotaru: OH MY GOD DADDY!!! It's a La Smoking Nuclear Bomber! Tux has a maniacal look in his eyes, run away!!!! Tuxedo Kamen: "HeHHEhHEHHHEH....IT'S ARISTOTLE!!!! ARISTOTLE I SAY! HEE...WHEEEE..."
P. Tomoe: Well, it's time for me and Hotaru-chan to sign off, until next time, Sayonara!